Have you ever had cream cheese chicken bundles low carb style? They are every bit as smooth and flavorful as the chicken bundles with puff pastry and cream of chicken soup…you won’t feel like you’re missing out at all! Creamy chicken bundles are traditionally made with a cream of chicken soup, wrapped in a puff pastry or crescent roll dough, and baked. 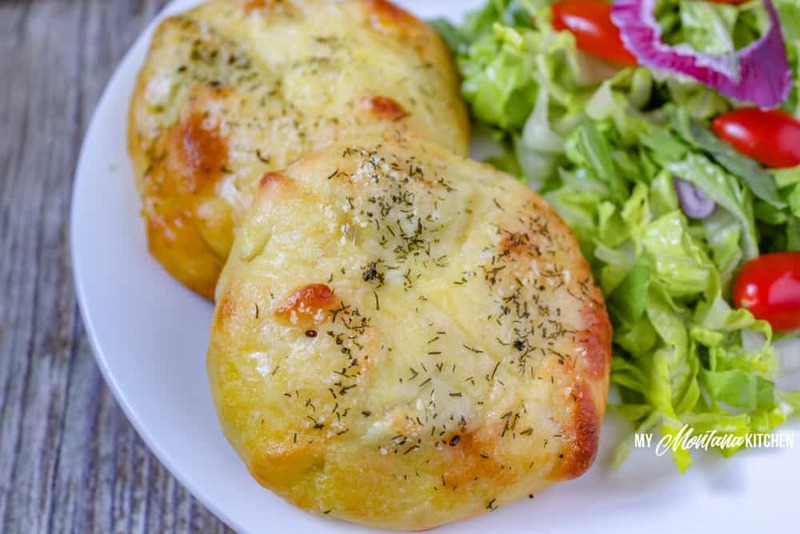 These low carb chicken bundles are made with cream cheese, chicken, and a pop of dill and then wrapped in mozzarella dough and baked to golden perfection. Even better? 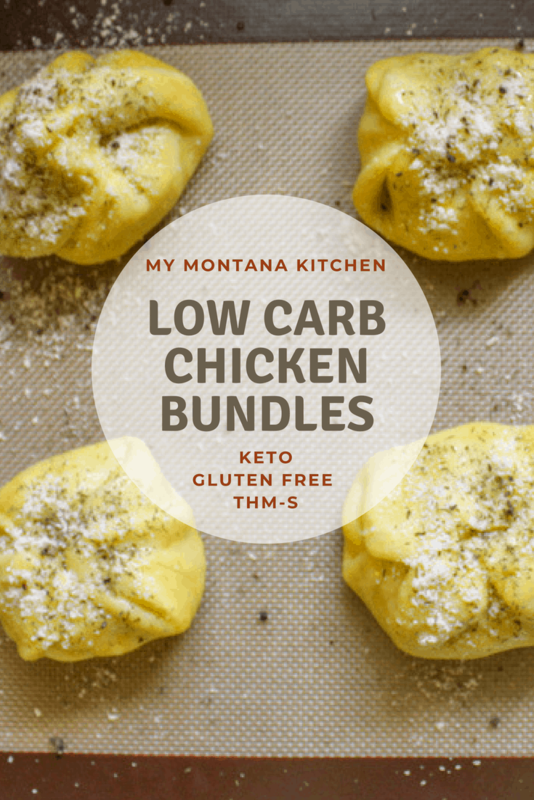 This chicken bundle recipe is low carb, gluten free, keto -friendly, and a Trim Healthy Mama S Fuel (THM S). The original version of this recipes comes from my mother-in-law’s kitchen (she’s got some great meals!). 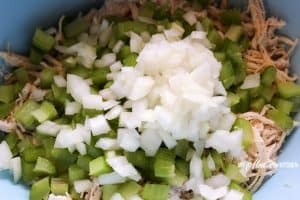 My husband grew up eating chicken bundles and this low carb chicken dinner is a favorite today because of it. His mom even came to our home when we made these for the photos and showed me how to form them and bake them; this is a fun meal to make. The first recipe I converted from her kitchen was the Surprise Cupcake recipe, and it was a smashing success! Many people have told me that it is their favorite low-carb cupcake recipe! It’s certainly my favorite. Another wonderful recipe from her kitchen is the Blueberry Coffee Cake with Cream Cheese. You should definitely give that a whirl for a low carb sweets recipe or a delicious brunch addition. But back to the recipe at hand – these adorable little cheesy chicken bundles aren’t difficult to make, and the taste – wow! 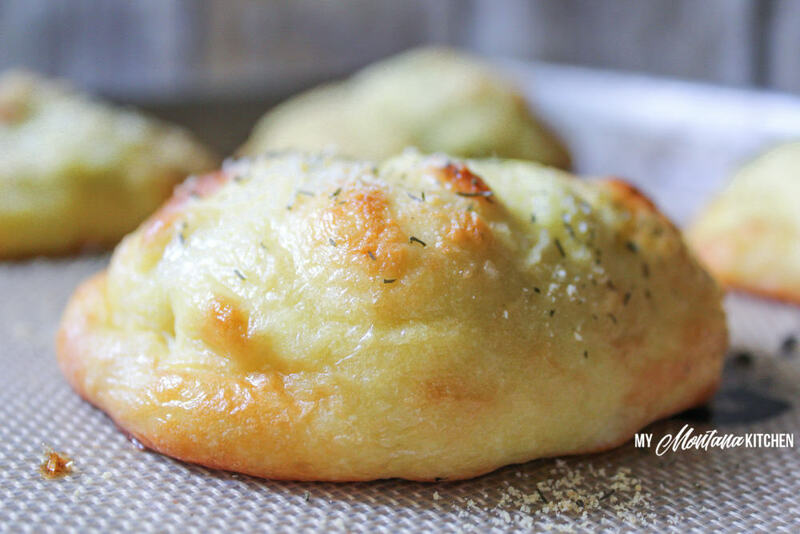 That is a pop of dill flavor in the cream cheese filling just makes them so good. This recipe makes six chicken bundles as written, but it’s easy enough to double if you’re serving it to a whole family or you want to make them ahead. Honestly, they’re so good that you might need to triple it! You can easily eat two per person and they reheat well. This healthy chicken bundles recipe is very versatile; you can add any spices you like or keep it nice and simple. 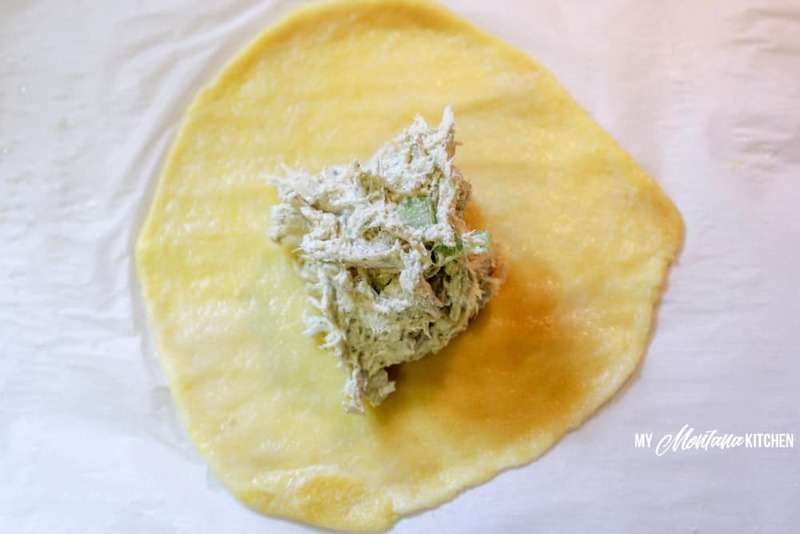 I really like the simplicity of the celery, onion, and dill in the filling…the dill weed is what really makes these Low Carb Chicken Bundles! You can use dried or fresh dill, whatever you’ve got on hand. I recently purchased freeze dried dill weed, and found that I much prefer that to the regular dried dill weed you can purchase in the store. Believe it or not, I got it in the spice area of my local Walmart. For the dough, you’ll use mozzarella dough. That’s the same dough used for Stromboli and Calzones and it’s simple, doughy, and delish. 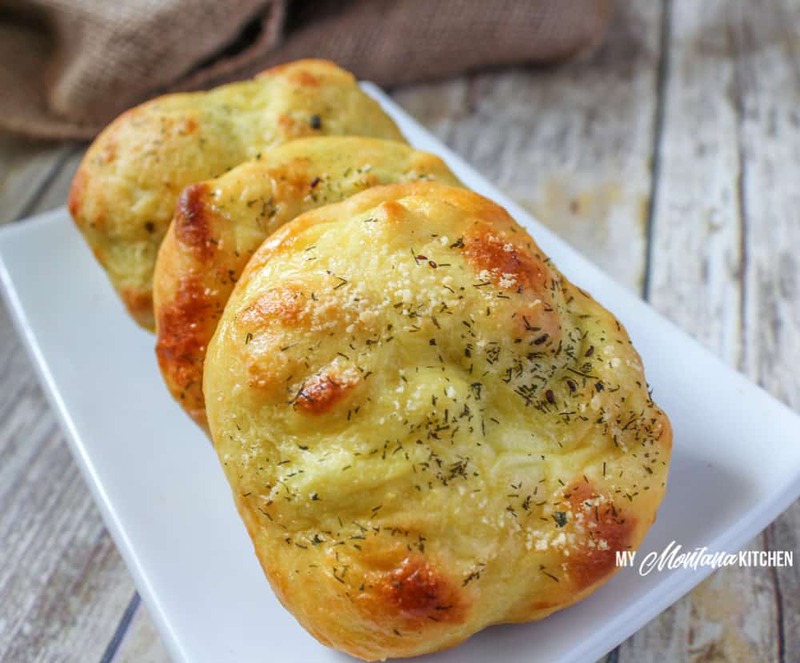 While the mozzarella dough recipe calls for THM Baking Blend, if you don’t have it on hand or cannot have the oat fiber, there are still a couple of ways you can make this. You can substitute almond flour for the Baking Blend completely, or use an equal mix of almond flour, flax meal, and coconut flour. Remember, you can mix these up with different vegetables or spices inside; your creativity can really shine with this recipe. You could make Mexican inspired cheesy chicken bundles by using taco seasoning, bell peppers, and onions or even adding in some jalapeños or easy avocado salsa. Another yummy variation is to make low carb chicken bundles with a Mediterranean flair by using sun dried tomatoes, kalamata olives, and purple onions. Buffalo chicken with celery is another yummy option. Now you have no excuse not to make these low carb cream cheese chicken bundles for dinner this week. I have no doubt they will be a favorite in your home, too. Two of these chicken bundles and a side dish or two make the perfect dinner. You could serve these creamy chicken bundles with a big side salad and a low carb vegetable, such as roasted green beans or Easy Oven Roasted Broccoli. Your kids may enjoy rice pilaf or cheesy cauliflower. They are so simple to make and everyone loves them. And if your family really enjoys the idea “bundles” for dinner, be sure to try Low Carb Cheeseburger Buns next. 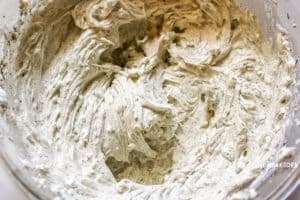 My THM blogging buddy, Jennifer, has a another recipe you might enjoy.. She blogs at A Home With Purpose, sharing lots of Trim Healthy Mama friendly recipes! Her recipe for Cream Cheese Chicken Bundles is a little bit different, so you will want to check it out! Be sure to sign up with your email address so you can receive new recipes delivered right to your inbox! Also, I can’t wait to connect with you! Come visit with me on Facebook, Pinterest, Instagram, and Twitter! If you make a recipe and love it, please leave a comment on my Facebook Page or tag me on Instagram (my_montana_kitchen_thm)! And check out “My Top 10 Low Carb Dessert Recipes.” You’re definitely going to enjoy adding this e-book to your collection! Have you ever had cream cheese chicken bundles low carb style? They are every bit as smooth and flavorful as the chicken bundles with puff pastry and cream of chicken soup...you won't feel like you're missing out at all! Mix chicken with cream cheese, yogurt, dill, onion, and celery. 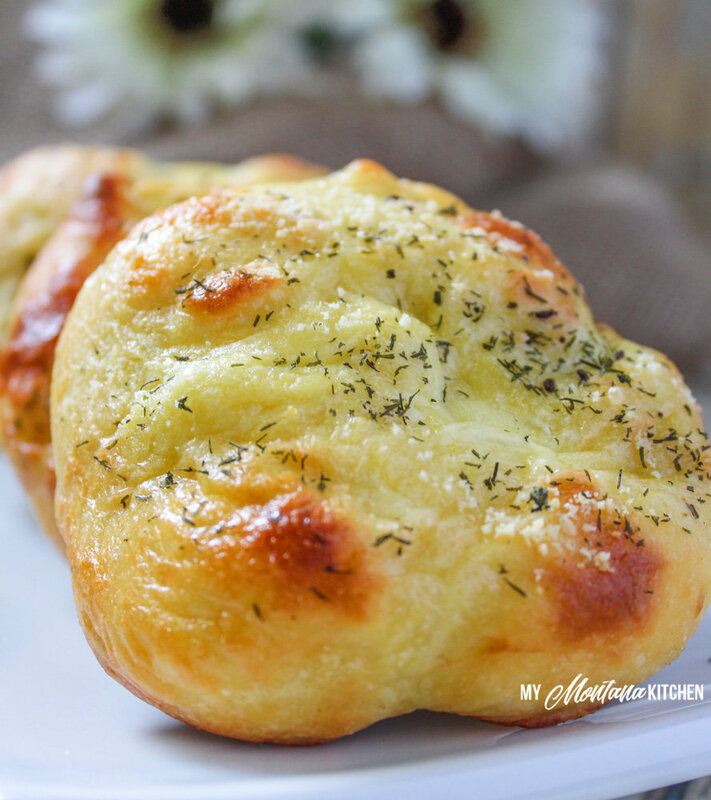 Make Stromboli Dough and divide the dough into 6 pieces. On parchment paper, roll each piece into an approximately 6 inch circle. Place approximately 2 Tablespoons of chicken mixture in the middle of each circle. Pull up the edges of the dough and seal at the top (see video above for a photo). Place on a parchment lined cookie dough sheet (I used my silicone mat). Brush the tops of the bundles with beaten egg. Sprinkle the tops of the bundles with the grated parmesan cheese and a sprinkle of extra dill. Bake for 15 minutes, or until tops begin to turn golden brown. If you do not have the Trim Healthy Mama Baking Blend, you can substitute all almond flour. Or, you can use an equal mix of almond flour, coconut flour, and flax meal. I would definitely double the recipe – these would go so quickly in my house!! in the chicken bundle recipe, do you mean a rib instead of a stalk. to me a stalk are all the rib combined. I personally have not, but I think they would freeze well. Which THM mix did you use? Amazon seems to have a couple to choose from (oat blend, super sweet, etc….)? Thanks! Do you think these would turn out OK with that free cream cheese? I’m assuming you mean fat free cream cheese? I probably would not use the fat free, but 1/3 less fat should still work just fine. I made these on Super Bowl Sunday and they were a huge hit! And I had one leftover for lunch. Delicious!! 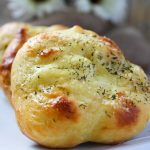 I keep seeing click the link for Recipe Stromboli Dough but where is the link? I’m so sorry – I switched recipe card plug-ins and some things didn’t convert properly. I have fixed the issue now. Thank you! Could you use sausage meat in these? This looks so good… But, please show the calorie/carb. count since you designated them as low carb. I am struggling trying to find low cal and carb. recipes. Your posts all look so good. Thank you. Hi Carolyn! I do include nutritional information on all of my posts now. Unfortunately, my older posts (older than a year) do not all have the nutrition info. I appreciate your attention to macros! That is not always an easy task! I usually use My Fitness Pal to calculate nutritional information. I would consider this ok to have when trying to lose weight . . . there should not be anything in this recipe that would put you out of ketosis (that I know of). Can these be made ahead and then re-heated? Or will they get soggy? Yes, they can be made ahead. These reheat great!